It’s a good time to be a beer lover in Brisbane. The paint had barely dried on South Bank’s German-inspired mega pub Munich Brauhaus before the Rockpool Dining Group announced its follow-up venture – a modern beer-centric concept housed within the iconic Royal Snack Bar building in Bowen Hills. Featuring dozens of taps pouring 40 imported and local beers and a kitchen primed to pump out Bavarian bites and Ekka-inspired snacks, Bavarian Beerhaüs is delivering the goods from schnitties and snags to strawberry sundaes and dagwood dogs. 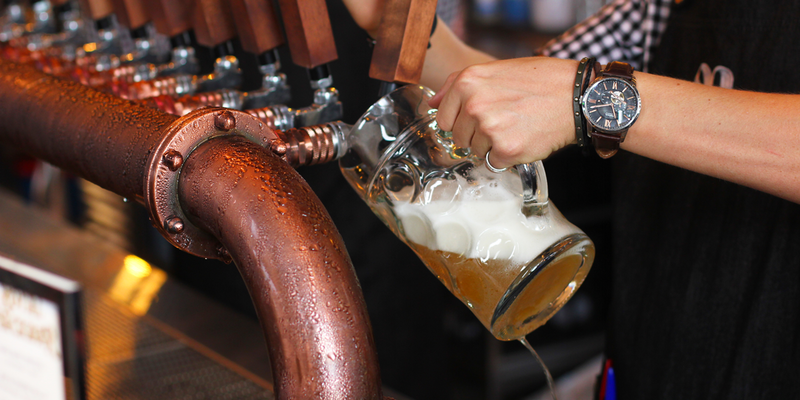 Turn off Gregory Terrace on to King Street and you won’t be able to miss Bavarian Beerhaus. It sits inside the refurbished Royal Snack Bar, sidling in snugly beside Welcome to Bowen Hills and turning its end of the King Street Co-op into a bona fide dream drinking and dining destination. Like its cousin Munich Brauhaus, Bavarian Beerhaus offers a spin on the iconic German beer-hall concept, but spruces it up with some modern touches. Bavarian Beerhaus offers a nice juxtaposition of old and new, with a smart post-industrial palette of concrete and brick pairing with preserved heritage features of the original Royal Snack Bar building. A sunny beer garden stretches the venue’s length, with ample interior seating bringing capacity up to a whopping 350 seats. Ping-pong tables, foosball and television screens add a fun liveliness to the space, while vintage-inspired artworks contribute decorative flourishes. While the name has surely clued you in, Bavarian Beerhaus’ array of frothy ales goes above and beyond the standard selection of most beery watering holes. The bar boasts one of the biggest collections of German draught beers in town, with a curated edit of drops encompassing recognisable names such as Löwenbräu, Stiegl, Spaten, Hofbräu and Franziskaner. The Bavarian brews are bolstered by a clutch of Australian beers from the likes of Hope Brewhouse, Green Beacon, Young Henry’s, Stone & Wood, Burleigh Brewing Co and Rockpool’s own Urban Craft Brewing Co., plus a rare appearance by Californian brewer Lagunitas Brewing Company. Non-beer drinkers needn’t fret – you’re amply catered for as well, with a large range of wines, cocktails, specialty schnapps and even espresso martinis on tap. 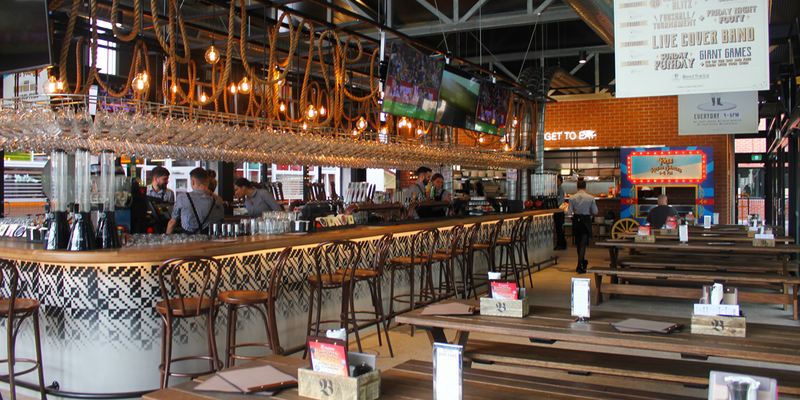 Fans of Rockpool’s take on Bavarian cuisine will be able chow down on staples such as crispy pork knuckles, chicken schnitzels and German sausages, though the Royal Snack Bar and barbecue menu are what gives Bavarian Beerhaus a tasty point of difference. Barbecue platters loaded with pork belly, saucy coffee-spiced ribs, wagyu tri-tip steak and chicken wings are perfect for divvying up amongst the crew. 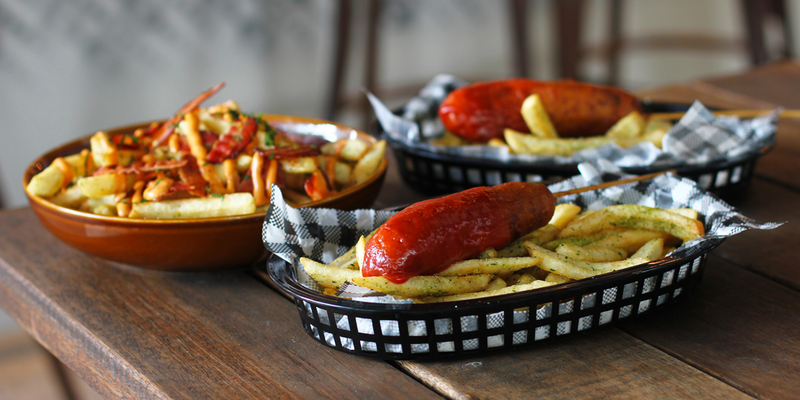 The kitchen also pays homage to the Ekka’s vibrant history with a take on traditional exhibition snacks such as dagwood dogs, loaded fries, house-made pretzels and strawberry sundaes. Desserts and build-your-own salads and wraps round out the menu, ensuring all bases are covered. Bavarian Beerhaus is open now and this weekend will see the venue celebrate its launch with roving entertainment, circus-inspired games, meet-the-brewer sessions and prizes. Head to the Stumble Guide for opening hours and contact information.